The Society's investigations have borne fruit, but they've also awakened a terrible foe. To avert disaster, the PCs embark for the lawless frontier harbor of Port Eclipse, where one of the Society's allies disappeared while seeking a powerful weapon. In this shadowy urban landscape, it's up to the PCs to find the lost operative, track down this relic, and bring it to bear against the ancient evil that now threatens them all. 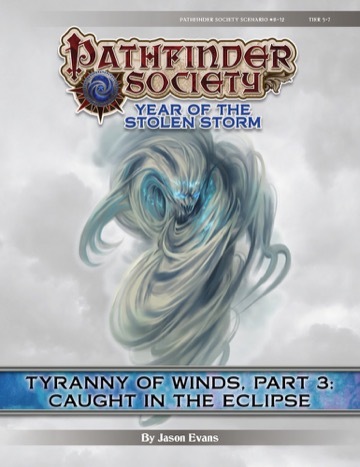 Caught in the Eclipse is the final scenario in the three-part "Tyranny of Winds" campaign arc. It is preceded by Pathfinder Society Scenario #8-08: The Sandstorm Prophecy and Pathfinder Society Scenario #8-10: Secrets of the Endless Sky. All three chapters are intended to be played in order. In as a player or GM for the second table. Alex is in to play. I can be in for the second table since I have not done parts 1 or 2 of this. i don't think we can get a second afternoon table. let's find out tonight. I believe we can get a second table if one table plays up front.